Facebook is an online social networking website. It is very international, 70% of users come from outside the United States, and offers more than 70 different languages. Facebook is the world's most trafficked sites. And the active applications on Facebook are more than 550,000 and growing. According to statistics, all users spend at least 83 hours a month on Facebook. You will not be unfamiliar to Facebook. You can leave messages on the Wall to your friends, send a funny icon as a gift, post the free trade ads, poke your friends and so on. You can enjoy share your life and make more friends. When you have some funny iTunes video clips, and want to share on Facebook. The iTunes videos purchased or rented from iTunes Store are encrypted by DRM, which can keep you from playing the M4V videos except on the Apple device with authorized account. It must be a trouble to share them to your friends on Facebook. Fortunately, M4V Converter Plus can solve the problem. 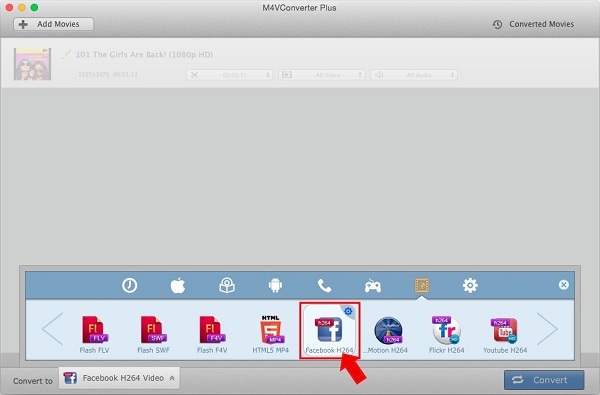 M4V Converter Plus can do well in removing DRM from iTunes M4V videos and convert the M4V video into Facebook video. The M4V video can be played well on Facebook. Step 1. 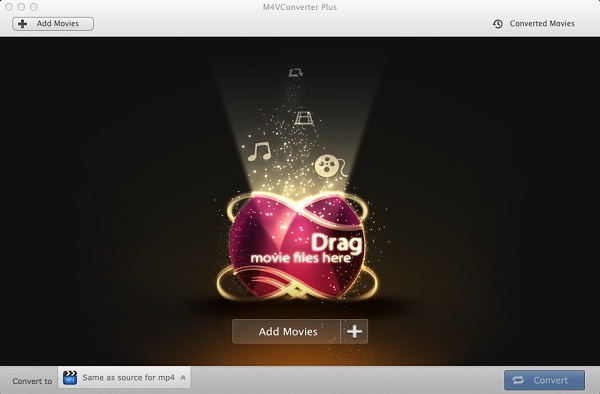 Download M4V Converter Plus, install and run on your Mac. Step 2. Add iTunes video to M4V Converter Plus. Click Add Movies button and choose a video listed in the pop-up window, and then click Add. 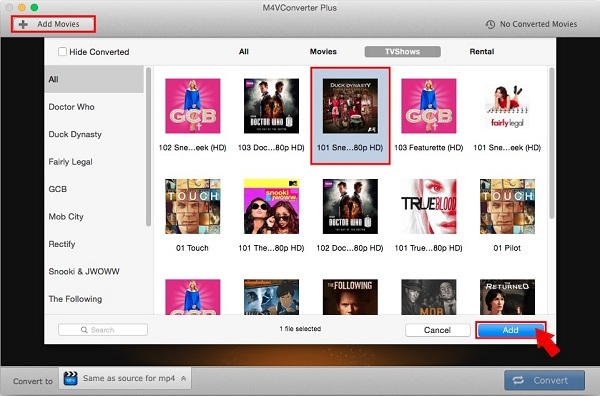 M4V Converter Plus can allow you to import iTunes purchased movies, Rentals, TV Shows and music videos in batch. Step 3. Choose the Facebook video format. Click Convert to drop-down list and choose Facebook H264 Video as the output format. MP4 and MOV is recommended by Facebook support center, so here you can also choose Same as source for mp4 and Same as source for mov as output format. Step 4. Convert iTunes M4V videos to Facebook. Click Convert button to open the converting box and start converting. After the conversion is done, you can find the output in the Converted Movies option. Log in your Facebook account. Click Photos/Video and choose the converted files to upload to Facebook directly. With M4V Converter Plus, you can get the output with Facebook video format without DRM protection. Then you can upload iTunes video clips to your website on Facebook successfully.